When most people think of the winter holidays, snow come to mind. Tornadoes? Not so much. However, as November comes to a close, we have a threat in the South of tornadoes. If you're like me, you're currently thinking about how you ate way too much over Thanksgiving. You might be regretting how you spent way too much time sitting on the couch watching football instead of trying to burn off all the calories you consumed. Or maybe you're doing some Cyber Monday shopping and spending way too much on gifts for yourself? While doing any or all of the above, make sure you keep an eye on the weather! There have been many news stories lately about how quiet this November has been, as far as tornadoes go. The above image shows the average number of tornadoes per state for this month. 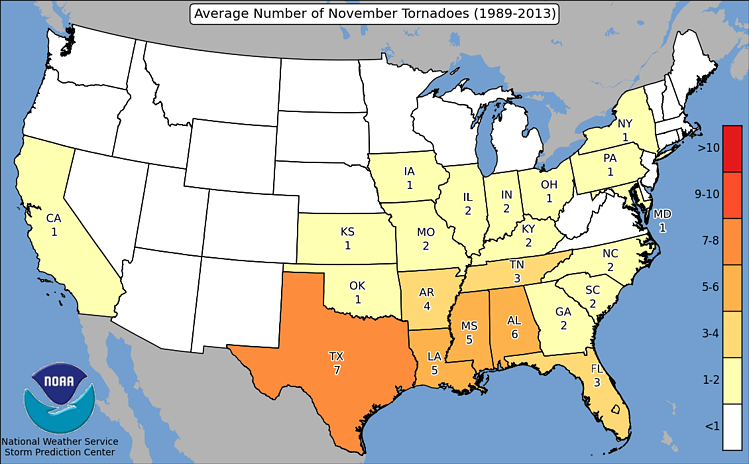 As of November 27, only 6 tornadoes have been reported this month. One tornado was in Kansas and the other five were in Nebraska. That number could go up today. 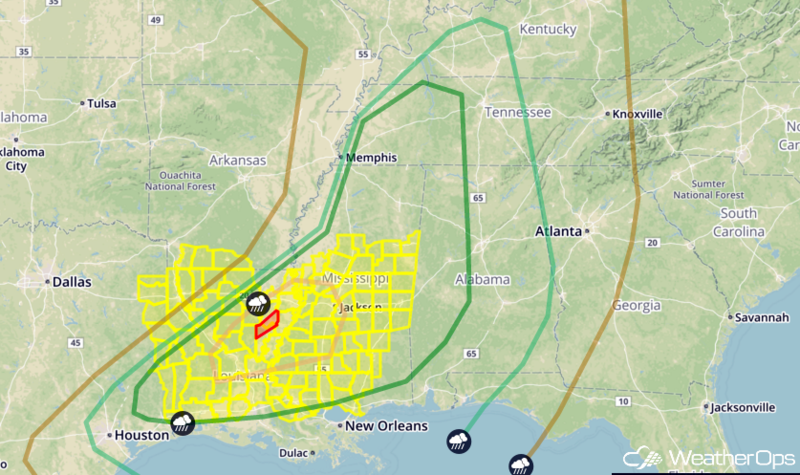 There is currently an Enhanced Risk of severe thunderstorms for northeast Louisiana and southwest Mississippi. An Enhanced Risk means numerous severe storms are possible with the possibility of tornadoes, damaging winds and hail. Two tornado watches (yellow) have been issued for parts of Texas, most of Louisiana and Mississippi. The western most watch is valid until 5pm CST while the other is valid until 9pm CST. A Tornado Watch means conditions are favorable for a tornado to develop. When a Tornado Warning (red) is issued, that means a tornado has been spotted or is imminent. This would be a good time to download our Weather Radio app to stay weather aware no matter where you are located. You can also keep up to date with this developing weather by subscribing to our daily Weather Summary. Just click on the Subscribe button located in the banner. If you need more site specific forecasts, let us know. We can do that for you too.